1. Convert between M, m, N, Mass % and Mole Fraction solution concentration expressions. 2. Explain exothermic and endothermic heats of solution. 3. List the factors that affect solubility (Henry's Law) and rate of solution formation. 4. Compare and contrast unsaturated, saturated, and supersaturated solutions. 4. Explain how the vapor pressure of a solution compared with the vapor pressure of a pure solvent. 5. Colligative properties --> Be able to explain the impact of a solute upon freezing point, boiling point, and osmostic pressure. 6. 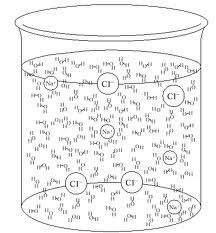 Apply colligative properties equations to solve for change of boiling and freezing points, molality of solutions, molar mass of solutes, and osmotic pressures. 7. Apply Raoult's Law. Interpret a negative or positive deviation from Raoult's Law. *** CORRECTION for PROBLEM #9 <-- click on!